You don’t have to be in the wilderness to make biodiversity discoveries. One of our scientists, Lara Shepherd, recently made an exciting find whilst walking home from work. Earlier this year I was walking through Wellington’s Mount Victoria when I saw a very odd looking mushroom. 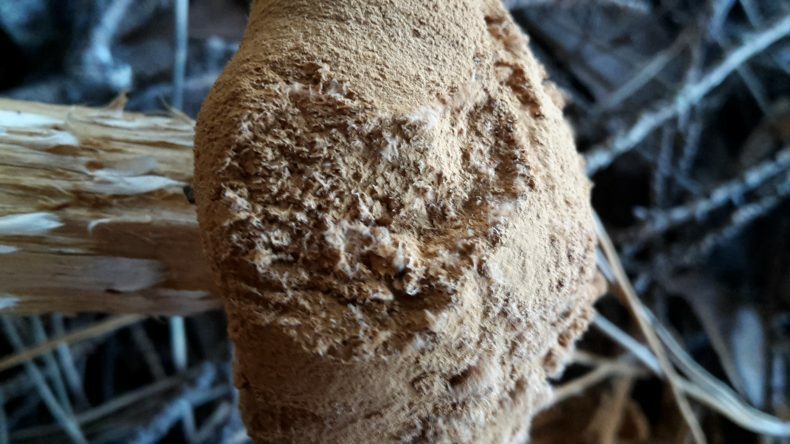 It looked a bit like a like a puffball on a very long stalk and its spores covered the surface of the cap, rather than occurring underneath in gills. I took some photos of the fungus and uploaded them to the NatureWatch website (New Zealand’s version of iNaturalist). This citizen science platform allows anyone to upload a photo of any living thing so that experts can provide an identification. The photos are also a permanent record of the biodiversity occurring in an area. 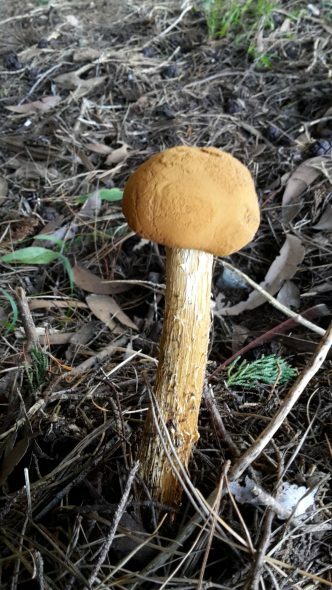 Landcare Research’s fungi expert Jerry Cooper identified the fungus in my photos as a sandy stiltball (Battarrea phalloides), which had not previously been recorded in New Zealand! We recently wrote up our finding and it has just been published in the New Zealand Journal of Botany. The sandy stiltball is a saprophytic fungus, meaning that it lives on dead or decaying organic matter. It’s been found in 64 countries and is recorded from every continent except Antarctica. However, it tends to be very uncommon with many records only consisting of one or two individuals. Most overseas records of the sandy stiltball are from desert or savanna regions (quite different to Wellington), but it’s been recorded several times from locations with either similar or more rainfall than Wellington. We suspect that the New Zealand specimen is a recent arrival from Australia having dispersed across the Tasman Sea with its very small spores. DNA analyses should help determine the source of the New Zealand specimen. We did generate a DNA sequence from our specimen but sequences from Australia are not available at present for comparison. Our finding demonstrates how citizen science platforms, like NatureWatch, can lead to new discoveries. It’s easy to sign up and I would encourage anyone with an interest in the natural environment to give it a go – who knows what you’ll find! Hi Lara, just thought you may be interested to hear that I found a small crop of about 12 of these in Wanganui yesterday (March 9th). Very interesting – I’m inspired to give NatureWatch a go. Thanks Olwen. NatureWatch is heaps of fun but quite addictive! Very interesting Lara – I’ll keep my eye out for them next time I’m walking the tracks. Thanks Jennifer. We’d be interested to hear of any new records of this species from anywhere in NZ – let use know or load them on NatureWatch.